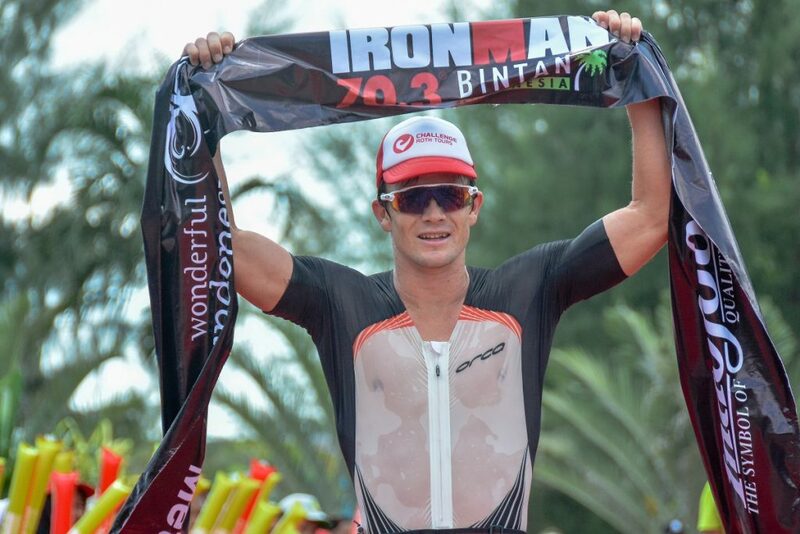 IRONMAN 70.3 Bintan once again showcased a world-class triathlon event as the pair of New Zealand professional triathletes in Mike Phillips and Amelia Watkinson each broke course records on their way to claiming top prizes in the $15,000 total professional purse. Phillips battled a competitive men’s professional field to win in 3:54:37, a 2 minute and 41 second winning margin over the fast charging Italian Domenico Passuello. Passuello finished in 3:57:18 while defending champion Fredrik Croneborg of Sweden completed the podium finishing 3rd with a time of 4:01:55. “Bintan is a beautiful place, a lovely beach, one of the best swim and bike course I have done. The bike is really challenging, with fast roads as well, and a great course overall” said 2017 champion Mike Phillips. Amelia Watkinson followed her strong showing in IRONMAN 70.3 Philippines, by winning another title in Asia, finishing in 4:20:54. Watkinson dominated the women’s field with a winning margin of 12 minutes and 19 seconds over Anna Eberhardt (HUN). Eberhardt finished in 4:33:13 while defending champion Kate Bevilaqua (AUS) rounded up the third place podium by finishing in 4:41:46. 2016 Champion Kate Bevilaqua did not want to miss the race. Despite her limited training, Kate was extremely happy with her result. “Oh my gosh, look at the atmosphere! It’s fantastic and I love coming here! When I’m out there, the conditions are tough but I like that; the volunteers and spectators are fantastic, and I love the bike course. It’s no wonder this is one of the best 70.3 races. I will be back next year!” added Bevilaqua. The heart and soul of the race are the age groupers and it was just fitting that the top age group triathlete, Olivier Godart from Luxembourg finished 4th overall, even beating a number of pros. Godart’s 21km run split of 1:16:55 was the race-best, 3 minutes and 58 seconds faster than anyone, including the pros. The 2017 IRONMAN 70.3 Bintan race saw more than 1,150 athletes start, representing 39 countries. The event saw 28% growth in this year’s registration numbers, boosted by the 95% athlete satisfaction rating in the 2016 global IRONMAN 70.3 survey that placed the event 1st in Asia. One of more than 100 events in the global IRONMAN 70.3 Series, the 2017 IRONMAN 70.3 Bintan triathlon race took the athletes along a 1.9-km swim, 90-km bike and 21-km run on the beautiful island course of Bintan, Indonesia. Athletes from 18 to 80 years old began their day with a one-lap swim from the white sand beach of Lagoi Bay. Bintan is a tropical paradise and no wonder the swim course is voted as Asia’s best by AsiaTRI.com. It is characterized by excellent visibility and calm waters in the protected bay. The triathletes were greeted by Asia’s best bike course (as awarded again by AsiaTRI.com) on a single lap with endless views of lush, dense green forest and fantastic coastal scenery. As cyclists rode past jungles, villages and beaches, the local population came out in force to cheer the participants, giving this event a very special Indonesian flavour. The triathletes ended their journey with a new 2-lap run course along an out-and-back section beside the manicured lake before reaching the “green corridor”, a stunning and cooling section of forest. Three IRONFAN cheer zones, reachable by a fun boat ride on the lake, awaited supporters where music, costumes and goodie bags were plentiful. Athletes and their families were also kept busy with lots of other side events and activities that kept everybody entertained. The IRONKIDS Fun Run was held the day before the big race. There hundred kids, mainly from the island, got a taste of the action as they tackled the 1.5km course. Triathletes meanwhile were storming the official merchandise store at the expo, and getting tips and autographs from the pros. The event has all the elements to become one of Asia’s best due to the easy travel logistics, a scenic course, and a great race destination for athletes and their families. Bintan is easily accessible from Singapore International airport. It takes ten minutes from the airport to the ferry terminal and less than an hour by ferry from Singapore to Bintan. Once in Bintan, immigration is fast and smooth and athletes are only another ten minutes to most official hotels. The organizers provide shuttle buses every 45 minutes from official resorts spread around the many different beaches to the race venue. The journey takes only fifteen minutes from most of the hotels. See FULL Race Results and check out the Photo Gallery. The 2018 edition is set in 19 August. VERY EARLY BIRD registrations is now open with only 100 slots available. Indofood IRONMAN 70.3 Bintan Presented by Wonderful Indonesia is organised by MetaSport, a leader in multi-sport.